The staff was very friendly, the coffee pot could be larger. It was a clean decent sized room. It’s just like any other hotel I’ve stayed in before. The only complaint I have is not have hot water in the shower. Taking luke warm at best showers for the week was not fun. Worst service I have ever received! First time writing a review so please don't waste your money in this hotel. Staff also complain about this hotel. Rude housekeepers. The heater does not work at all! So take your jackets with you and sleep with your jackets at night. Complained many times but no one even came to check. No Toilette papers, shampoos, soaps, coffee, etc. They just make up your bed and that's all! They don't even care if you put a "Do not disturb" sign, they will come to your room and surprise you while you're wearing your underwear. Good luck calling them and asking for anything. If you receive them, then you should buy a lottery ticket. The only good thing about this hotel is the location, but you can find many many many better hotels in the exact street. Tub and sink were both clogged. Requested a 2 double bed and they put me in a one king bed. The first room they put me in already had a couple in there. The location was perfect for what I needed. The room was a normal size for NYC hotel rooms but there was a ton of dust along the wall by the back of the bed and by the night stand tables. There was weird dirt/grime under the glass on the nightstand table. There did not seem to be a great cleaning service with attention to details. Hidden fees. Cleanliness is in low levels. Rooms are very tiny. The staff was very polite at checkin and when we had any questions.....the only complaint we have was that we were supposed to have a pad in our room that was supposed to be like a newspaper and current events deal but we never saw that....it was nice having our own elevator to our floor! Located in Midtown, The Manhattan at Times Square Hotel is next to popular attractions like Broadway Theatre and August Wilson Theater. This 685-room, 4-star hotel welcomes guests with a coffee shop/café, a 24-hour fitness center, and free in-room WiFi. Start each morning with continental breakfast, available for a fee from 6:30 AM to 1 PM. Get a pick-me-up at the coffee shop/café. Guests can expect to find free WiFi and 37-inch a flat-screen TV with cable channels and pay movies. Pillowtop beds sport premium bedding and the bathroom offers a hair dryer and designer toiletries. Other standard amenities include a coffee maker, free weekday newspapers, and free international calls. 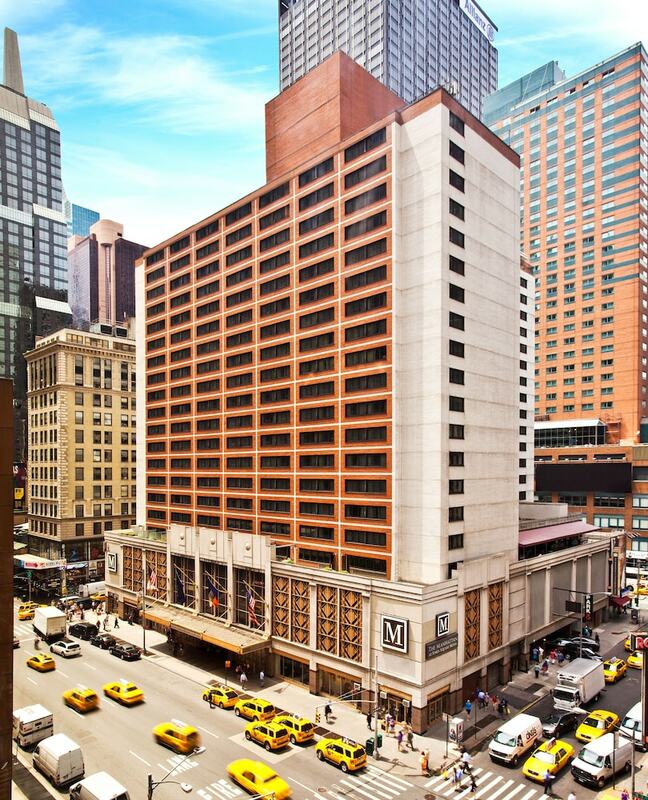 Guests of The Manhattan at Times Square Hotel enjoy a 24-hour fitness center, free WiFi in public areas, and a business center. Self parking is offered for USD 65 per day. Multilingual staff at the front desk are standing by 24/7 to help with concierge services, dry cleaning/laundry, and luggage storage. Additional amenities include coffee/tea in a common area, a computer station, and express check-in. Continental breakfast is served daily from 6:30 AM to 1 PM for a fee. Recreation features at The Manhattan at Times Square Hotel include a 24-hour fitness center.